The NJIT women's tennis team passed their toughest test of 2019, holding off the LIU Brooklyn Blackbirds for a 4-3 victory Sunday evening at the Naimoli Family Athletic and Recreational Facility. NJIT improved to 4-0 on the season, giving the Highlanders their best start to a season since 2011 and securing their best start since joining the ASUN Conference in 2015. The Highlanders continued the trend of this season by taking the doubles point and an early 1-0 lead. After losing their matchup at No. 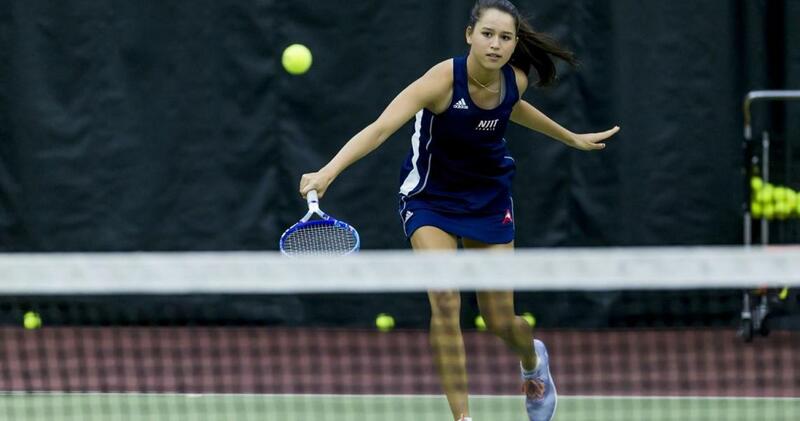 3, NJIT bounced back as sophomore Holly Matson and freshman Joleta Budiman edged out a 7-5 win at No. 1 and senior Rafaella Sampaio and Mouna Bouzgarrou did the same at No. 2 with a 7-6 triumph. LIU, champions of the Northeast Conference in 2018, tied the match quickly by winning the No. 1 singles match in straight sets, 7-6, 6-3. Budiman would put NJIT back in front, 2-1, after finishing the No. 2 singles match, 7-6, 6-2. Once again, the Blackbirds would answer, this time earning a point at No. 4 singles to even the score at 2-2. Matson would provide the Highlanders' response at No. 3, using a three-set victory (6-4, 4-6, 6-1) to put NJIT on the brink of victory. Junior and reigning ASUN Women's Tennis Player of the Week Mayar Eltony clinched the contest for the home team at No. 5 singles, coming out on the winning end of the closest match of the night, 6-4, 4-6, 7-5. "I am overwhelmed with this amazing win. My girls battled for over five hours to earn tonight's victory," head coach Zaki Abdelrahman said after the signature win. "We played against a very strong LIU team that won the NEC and qualified for NCAAs last year. I am so proud of my girls and how we fought from the first point until Mayar clinched hours later. The girls worked hard and they definitely deserved this win." NJIT will continue its homestand next weekend by hosting Fordham Friday, February 8 at 5 p.m. at Naimoli Center.